Here’s an early Christmas treat for Beatles fans. 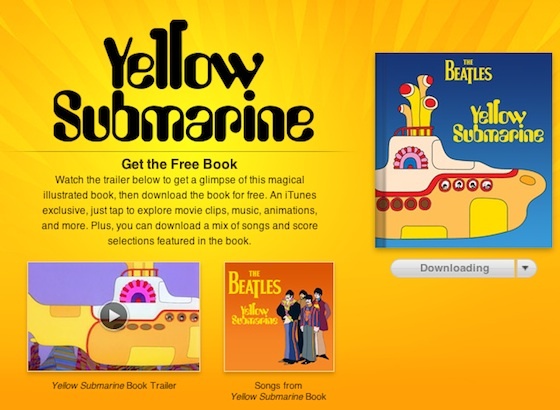 Apple has just released an animated ebook version of the 1968 animated musical fantasy film ‘The Beatles Yellow Submarine’ and they’re giving it away for free. The colorful illustrated ebook that features an animated fab four in their kaleidoscopic and magical adventures will work on iOS devices such as iPhone, iPad or iPod Touch and will be available exclusively in the iBookstore. Apple, the company that over a year ago, secured an exclusive deal to add The Beatles catalogue to iTunes is said to release this free ebook in order to promote an upcoming compilation album based on the songs featured in the book.